We heard a few days ago that our paper on red spirals has been accepted by the journal. Not only is this another success for Galaxy Zoo science, but it’s a tribute to the hard work of Karen who led the effort. What with the first Zoo 2 paper being submitted and a few other distractions as well it’s been a very busy week for her. 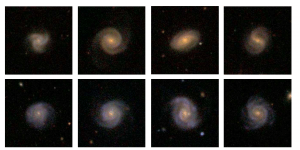 The paper itself is another variation on what should be becoming a very familiar theme for those who have followed Galaxy Zoo science: colour and shape are not the same, and tell us different things. To recap slightly, as young, massive and short-lived stars are blue, colour is a measure of what’s happened recently. The blue spiral arms in the galaxy pictured below, for example, mark sites of recent star formation. It was known long before Galaxy Zoo that most of the star formation in our local Universe takes place in spiral galaxies, and so they tend to be blue whereas ellipticals are often red. In looking at the blue ellipticals and now the red spirals, it’s clear that interesting things happen when this rule is broken. Before we can work out what’s going on though, we have to find our red spirals, and this is trickier than it sounds. If we weren’t careful, then our sample would get contaminated by edge-on systems, which appear redder because of the effect of the dust that scatters light which travels through the disk. As this paper uses only Zoo 1 data, we just selected the roundest spirals assuming that this would get rid of those pesky edge-on systems; we also insist that Zooites were able to identify a direction to the spiral arms. It turns out that 6% of spiral galaxies are red, which I think is higher than most would have guessed before this project. So how did a substantial number of spiral galaxies come to turn red? What caused them to cease forming stars and become what the paper title calls them : ‘Passive red spirals’? One important clue is understanding where this process happens. It turns out that the greater the density of the environment a spiral finds itself in (that is, the more neighbours it has) the more likely it is to be red…but only up to a point. Once we find ourselves near the core of a cluster of galaxies, the number and fraction of red spirals drops dramatically. So whatever it is that is causing the spirals to turn red must be more likely in the outskirts of galaxy clusters, but relatively rare outside this particular environment. The story is, as ever, a little more complicated than that. If it was the environment that was driving the dramatic change from blue to red, then we’d expect the properties of the red spirals to depend on the environment. We might find that those in the densest environments were redder than their (still quite red) counterparts further out, for example. But we don’t. We don’t see any connection between the properties of the red spiral and the environment they find themselves in. In my next blog, I’ll look at what we do know about this mysterious population of galaxies unearthed by your hard work. Until then, if you want the gory details, you can find the latest version of the paper over here. I truly know nothing about astronomy, but could this phenomenon have been caused by a long-ago extraordinarily-large radiation ‘burst’, the physics of which we have yet to learn? I ask about ‘radiation’ because could that alter the colour of, or our perception of the colour of the objects in question? It’ s a very big question mark (??) for me since a couple of years ago, and i’ m very curious for any satisfactory explanation. There is possibility for the red colored galaxies in outskirts of a cluster due to “drop” of the rate of collisios and mergers, which have as result massive starborns as interstellar nebulae of dust and gas are mixing each other.